Tupelo trees are known for their beautiful fall color and interesting shape. Ten species of tupelo trees make up the genus Nyssa. Five species are native to North America, and the others are native to east and south Asia. 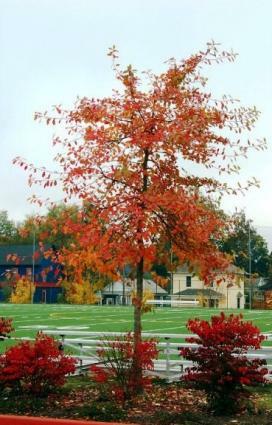 Nyssa sylvatica is grown for its beautiful foliage, while Nyssa aquatica has commercial value. Nysseides was the Greek water nymph who gave her name to the genus. The common name, tupelo, comes from two Cree words which mean 'tree of the swamp'. Tupelo is also sometimes called 'pioneer's toothbrush'. When a small, brittle twig is broken off sharply, it has a bundle of woody fibers on the end that was once used to clean teeth. It's also called 'bee-gum' because hollow trees were used as beehives. On Martha's Vineyard, the tree is called the beetlebung after the local use for this hardwood during the colonial period. The mallets used to hammer bungs, or corks, into barrels of whale oil were called beetles. The black tupelo tree has been in cultivation since 1750. It prefers a rich, moist, acidic soil and does not tolerate a high pH. It grows best in full sun but will tolerate light shade. Sour gum is hardy from zones 3 to10. The black tupelo tree has been in cultivation since 1750. The largest recorded tree is 144 feet tall and has a crown spread of 95 feet, although a height of 30 to 50 feet and a spread of 15 to 25 feet is more usual. The tupelo is not easy to transplant as it has a deep taproot. It should be watered deeply until it is established. It should also be watered during dry periods even after it is mature. This tree is not particularly vulnerable to any diseases or pests. Nyssa sylvatica is grown as a shade tree or a speciman tree. It is prized for its beautiful foliage, which is a glossy dark green in summer. It has brilliant fall color, and many shades of orange, yellow, bright red, scarlet, or purple may appear on the same branch. Tupelo Tree (Nyssa) - A small group of trees little planted, but having certain good qualities. One of the most brilliant sights I remember was a Tupelo tree at Strathsfieldsaye in Hampshire in autumn-a tall slender tree, in splendid color of leaf. The trees are mostly natives of N.E. America, a very cold country, so that there can be no doubt about their hardiness; and the fact that they grow in swampy places should make them easy to find a place in this river and estuary veined land. Nyssa Aquatica - Tupelo Gum rises sometimes to a height of 100 feet, and is rather of southern and western distribution. The two first-named species are the most important for England. Nyssa Biflora - Water Tupelo is a some-what smaller swamp and waterside tree, of N. Jersey and southwards.